Many people who want to apply through online procedure but due to some confusion they hesitate to apply online and apply thorough post. Today I am going to tell the steps which will guide you for applying online. Here I am telling about Combined Higher Secondary Level Exam(CGHL) but after reading this you can also apply for other SSC exam. Step 2. Then click on "Examination" on the right side and choose "Part I registration". Step 3. Then you will see the list of exam that are open for registration.You can see there last date for applying online then click on "Click Here" link in right end . Step6. Then fill up second page for instruction click below images. Step 7. Click continue. In next page you will see your complete detail check it because after this you can not change it. Then fill up cofirmation number at the below of the page click i agree button. Remember you write down the registration ID number from next page you will need for filling IInd part.After note down your registration id click on "Print Bank Pay-In Slip" at the down of the page and take a print out. There is no fees for thoe who belong to SC/ST/PH/ExSM/& Women . Part I Registration is complete. Now If you are belong to general category or any other and have to Submit fees. Then there whould be 2 option one is pay by "SBI online" banking and 2nd is "Through any SBI Branch". If you choose "Through any SBI Branch" option then follow below step. 1. After note down your registration id click on "Print Bank Pay-In Slip" and take a print out . 2. you just need to fill date on the slip of depositing day. You can deposit that slip in any SBI branch by paying Rs 100/- . they will return you half slip after writing a "Transaction ID " number. 1. Go to "ssconline.nic.in" click "Examination" and click on " Part II registration". 2. 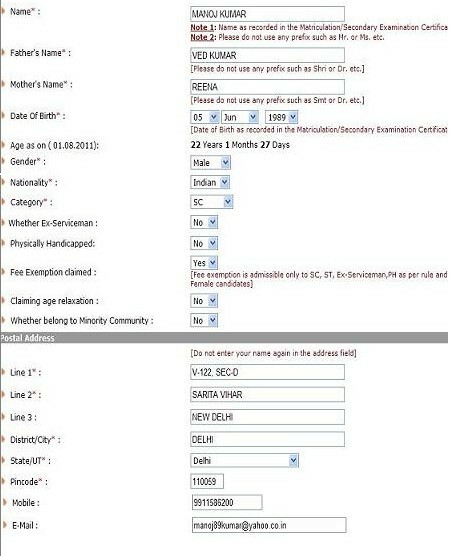 Fill up Registration ID which you wrote down from Part I registration and your date of birth . 3. Choose first option "Through any SBI Branch" click continue then fill up your transation ID number which is on the bank slip. 4. Now scan your photographs or take your photo by mobile which has 2 mega pixel camera atleast and take your picture in day light in white background and also scan your Signature or Sign on a plane paper and take a clear photo graph and convert both picture and Sign size as write below. You can use many picture resize tool like FILEminimizerPictures, Format factory etc. 5. Upload your photograph and Sign then you will see them if you satisfy with their quality then confirm and your registration is complete. You will receive a e mail which confirm your registration. I hope my this post will help you if you have any doubt then leave comments. For that you should have online account.